Anthony Caragol's Skype for Business and Teams Blog - Get ready for Microsoft Teams, we are! Get ready for Microsoft Teams, we are! A month or two ago, a few clients of mine received emails proclaiming the death of UM in the cloud. This caught me off guard as they’re not talking about third party PBXs or PABXs, but it appears to be talking about all Exchange Online Unified Messaging even for Skype for Business and Lync Enterprise Voice users. This somewhat makes sense and I imagined it would happen at some point due to it’s removal from Exchange 2019, however the time frame announced was tight at the time which has now been extended. Today a new announcement was made that gives more insight and detail into the migration. In a nutshell, for voicemail, the transition will occur on Microsoft’s side and no action is required by the user. Microsoft promises that the transition will be transparent. There are feature differences of course that you should be aware of, including the loss of voicemail rules (different greetings for different callers or personal menus), but the larger issue that will affect my clients is the loss of a dial-in number to access voicemail. This may not seem like a big deal these days, but for a small handful of corner cases it’s still considered critical. If you’re going to be affected by this, start planning your process changes now. Edit: Jonathan McKinney pointed out that a feature comparison can be found here: https://docs.microsoft.com/en-us/SkypeForBusiness/plan/exchange-unified-messaging-online-migration-support which I hadn’t yet noticed. Automated attendants will need to be manually rebuilt in the cloud, and that’s an entirely separate article and will require a bit of hybrid setup. Fortunately, enhancements are coming to Cloud Automated Attendant to beef the features up to make these more at parity with the premises versions. A copy of the original email that went out with less clear timelines is below if you’re curious (the service will not be discontinued in July 2019, but rather February 2020). “Microsoft would like to make you aware of the Exchange Unified Messaging (EXUM) discontinuation of service in July 2019. What is happening with the Skype for Business Server + Exchange Online Unified Messaging? Customers using this topology connect their Skype for Business Server(s) to Exchange Online for voicemail service. Microsoft has a new service – Cloud Voicemail and plans to auto-transition customers. 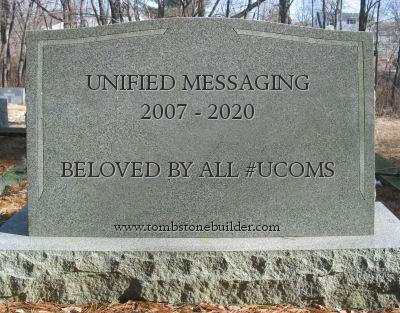 Unified Messaging will not be available in Exchange Online starting July 2019. Cloud Voicemail does not have some legacy EXUM features such as Subscriber Access, Message Waiting Indicator, Play on Phone and Personal Auto Attendant. We expect transition to be straight forward as Microsoft will move customers from Unified Messaging to Cloud Voicemail on an ongoing basis after July 2019. Customers using Auto attendants will also need to plan a migration. As part of our proactive outreach initiative, please help us better serve you by answering the following quick questions. What is your topology for SFB? What option is the customer considering for SBC Offboarding? What is the estimated date for customer to complete SFB offboarding? Does the customer use Auto Attendant capability? This entry was posted in Lync on February 8, 2019 by C. Anthony Caragol. Policy “Policy Name” is not a user policy. 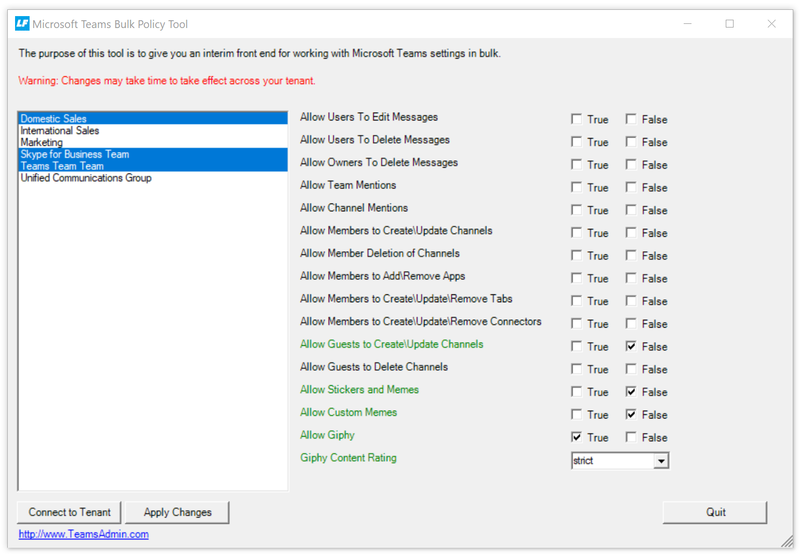 You can assign only a user policy to a specific user. What does it mean its “not a user policy”?!?! “You can assign only a user policy to a specific user”, you are! You know it’s a user policy, you literally just created it. You can see that it’s a user policy. What gives? You’re moving too fast, this is Office 365. Go get a cup of coffee or a beverage of choice, check your social media, think about what you want to eat next, then try again (the order is important). It should work now, if it doesn’t repeat the above steps with a new beverage. If you’re me, you’ll forget the next time too and need to check your notes. Hope this helped. This entry was posted in Lync on October 3, 2018 by C. Anthony Caragol. Do Inbound Calls Count with Microsoft Calling Plan Minute Pools? For the US and UK at least, domestic and international plans do not count inbound calls at this time. What this means is that if you have a single small 250 minute plan through your Enterprise Agreement, and you make 100 minutes of calls, but receive 200, you’re still fine. You’ve still got 150 minutes left because inbound calls do not count. Where is this documented and how do you know? It’s not well documented at this time, and that’s causing the confusion which is why I’m writing this. I know because A) I’ve been told this directly by members of the Teams product group. B) It is referenced briefly in Microsoft PowerPoint Decks and sites like this: https://answers.microsoft.com/en-us/msoffice/forum/msoffice_sfb-mso_other/pstn-calling-consumption-billing-questions/40795bc2-e44d-4b98-805c-182648da8c85 and C) It can easily be proven by watching the PSTN Minute Pools report in the Admin Console. I’ll be asking Microsoft to add something a little more concrete to their site for a more official message if you need to use this to back up a claim. 🙂 I hope this article helped you a bit. This entry was posted in Lync on September 26, 2018 by C. Anthony Caragol. This isn’t my typical area of focus, however I do work a lot with Azure, EMS, and Office 365 in general and a client brought this issue to my attention. Since Google and Bing yielded no results, I thought I’d blog it in case anyone else was searching for it. 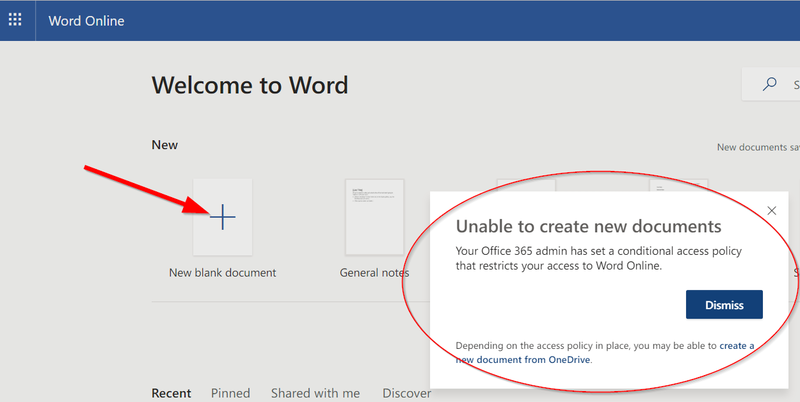 In a nutshell, if you configure a Azure AD Conditional Access policy for Exchange Online, your ability to create documents directly from Word Online and Office Online in general becomes blocked. 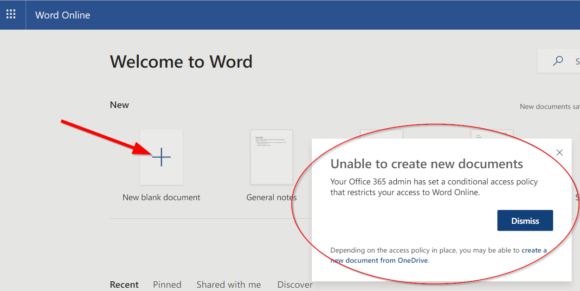 The error message you’ll receive, “Your Office 365 admin has set a conditional access policy that restricts your access to Word Online.” can be seen in the screenshot below. Here’s the catch, it’s expected behavior and there’s nothing you can do about it at the moment. I have a case open with Microsoft and will update this post if I find more but right now you’re stuck. There are workarounds such as creating the documents directly from OneDrive, and this is noted in the error statement as seen, however that’s a whole user education issue that’s going to be troublesome. When setting up conditional access, you have access to a select group of cloud applications. Some applications, such as Office Online are actually bundled with Exchange Online so when you set access control on one, you’ve set access controls on them all. I’m presuming that since Word Online doesn’t re-prompt you for authentication, you’re not going to get your additional conditional access challenge and you’re simply blocked. Again, my intention is the update this case if there’s any response from Microsoft as this is escalated other than “expected behavior”. This entry was posted in Office 365 and tagged conditional access, office online, word online on August 27, 2018 by C. Anthony Caragol. Many of my customers treat their AudioCodes Mediant (MSBG) IP gateways and session border controllers in a sort of set-it-and-forget-it way. Once it’s set up, it’s just runs, no reboots, no troubles. Not necessarily a great idea from a security standpoint, but it’s stable. Well, for those still on version 6.8 (or any pre-7 version really) it’s finally time. 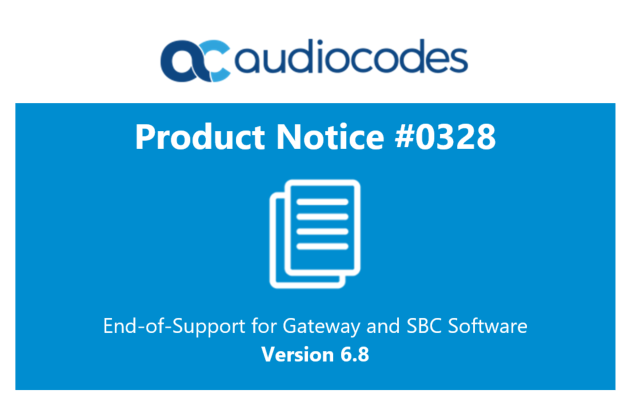 Per AudioCodes Product Notice #0328 https://www.audiocodes.com/media/12936/0328-product-notice-end-of-support-for-gateway-sbc-software-ver-68.pdf support is ending as of July 1st, 2018. That means no more support, scheduled maintenance, or fixes will be provided. One small item to note, if you have an MSBR, which has additional routing capabilities, 6.8 will continue to be supported. I supposed because I believe there’s no newer firmware supported for those guys, though I’ve heard there’s a way you can convert the device to an MSBG if you’re willing to leverage AudioCodes services to do so. This entry was posted in Lync on April 27, 2018 by C. Anthony Caragol. There may be time where a system was improperly maintained and the services are left in a disabled state, or perhaps you’re performing maintenance and you need those services to stay in a disabled state. Rather than going through them one-by-one and changing the startup-type, here’s a quick PowerShell command you can run to flip all Skype for Business or Lync Server services from Disabled to Automatic (Delayed Start) and vice versa. This entry was posted in Lync on April 5, 2018 by C. Anthony Caragol. Quick reminder for those of you in the Chicago area, tomorrow night is our quarterly Microsoft Teams and Skype for Business user group. These are always fun and valuable, and a great place to network with your peers and make those relationships. Vendors and local experts attend regularly as well so it’s a place to get those questions answered too! This time around there are two sessions, the first I’ll be presenting on Advanced Phone System capabilities for Teams and Skype for Business, the second will be around Bots and development capabilities for all of Microsoft UC. Should be a ton of fun! Please note this meeting will be held at the Downtown Microsoft Office in the Aon Building (200 E. Randolph, Suite 200). This entry was posted in Lync on March 19, 2018 by C. Anthony Caragol. I recently found myself in a position with Microsoft Teams where I had to make changes to multiple teams at once, the problem was that the team naming convention in use by the client was practically random as they let their users govern themselves. Finding and selecting them in PowerShell or via the Admin Console was too much trouble. If you’re curious, certain groups needed to be locked down in terms of custom memes and Giphys but I won’t say more than that. The client had more than they wanted to approach one-by-one and wanted my help building a script. To finish the job, we did a simple hardcoded script but I went away wanting something more flexible. This is the result. Next steps for this script, are the ability to add an owner or a team member to multiple groups quickly, and a few other niceties that I had in mind. Please let me know if you’d like to see anything added and I’ll do my best to get it in there. Visit here to download a copy, and I’m not afraid to beg for that 5 star rating. If you don’t like it, let me know and I’ll fix it. Thanks! This entry was posted in Lync on March 7, 2018 by C. Anthony Caragol. I officially have permission from Microsoft to reveal to you that the Standard Edition role is BACK IN Skype for Business 2019. If you remember, at Microsoft Ignite last year it was confirmed that this version would be removed and the only option for Front End pools would be Enterprise Edition. It’s not just small organizations that use this role, very large enterprise corporations also use it in smaller branch offices where survivable branch appliances (SBA) just aren’t a good fit. While it is possible to have a single front end in an Enterprise pool, a full version of SQL was still required, which could be costly in small organizations and even branch office scenarios. I want to give a special thank you to Microsoft for reconsidering this feature, and all of you that voted and commented in the feedback link below (though you don’t need to anymore). This entry was posted in Lync on February 8, 2018 by C. Anthony Caragol. TeamsRecap (if you don’t subscribe you should) is MVP Josh Blalock’s video series that keeps you up to date on Microsoft Teams and Skype and walks through what the news is and what it means. It’s a convenient way to keep up to date if you find the constant announcements of new features a bit too much. Honestly, Teams is one of the fastest developing projects I’ve seen at Microsoft and they are keeping true to the roadmap and hitting those dates. Josh’s show is very interesting to watch, super valuable, and an easy way to stay current. Josh was kind enough to let me visit for one of his shows, and I want to thank him for that. It was a fun time and a great experience. This entry was posted in Lync on February 7, 2018 by C. Anthony Caragol. The Microsoft Teams and Office 365 Creation Lockdown Tool contribution has been downloaded 100 times from the Technet Gallery. Awesome! Received a 5 star rating on the Microsoft Teams and Office 365 Creation Lockdown Tool contribution on the Technet Gallery. The Microsoft Teams and Office 365 Creation Lockdown Tool contribution has been downloaded 50 times from the Technet Gallery. Congratulations!